Here we accidentally delete the contents of datastore via the vSphere Client and have to recover it. 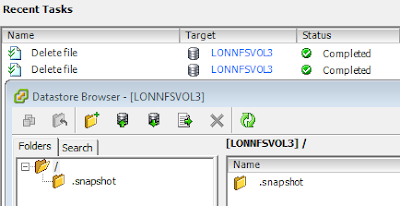 In the example below, we have the LONNFSVOL3 datastore - which contains 2 VMs - and all the contents of the datastore will be deleted. Note: It’s not possible to delete an NFS datastore via the vSphere client, only unmount. 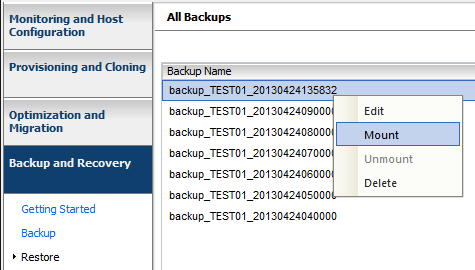 And wait for the contents of the Datastore to be to the original datastore! IMPORTANT NOTE: What’s interesting here is that the contents of the datastore are copied into the original volume. The snapshot is not simply rolled back (which would be much quicker.) This approach makes sense in the situation where new stuff has been added to the datastore which we don’t want to lose, and just the old contents need to come back in. In this highly nested lab, it took 30 minutes to do two VMs of 4 GB size.